Alfa Romeo is finally joining the SUV game and it's doing it with a 505-hp player capable of running to 60 mph in 3.9 seconds. Saying an Alfa Romeo SUV has been a long time coming would be the understatement of the year, especially since the company unveiled the Kamal SUV concept way back in 2003. The wait is now over as the FCA-owned marque has taken the wraps off the Stelvio at the Los Angeles Auto Show where it’s being exhibited together with the cream-of-the-crop Quadrifoglio version. 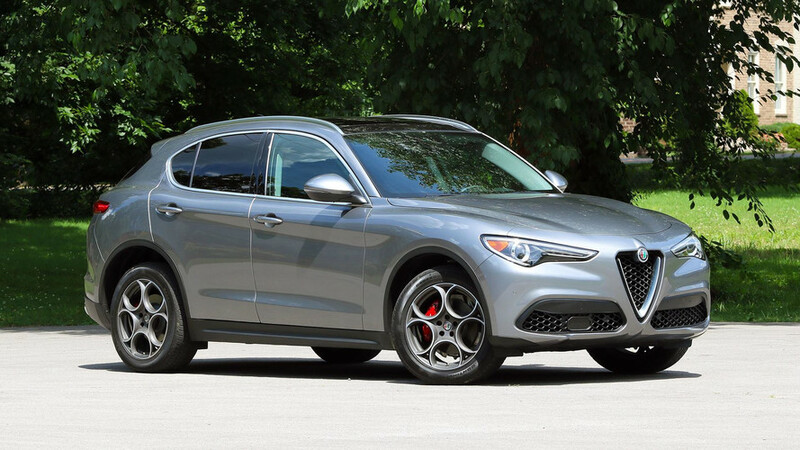 The Stelvio’s exterior design can be best described by using just two words: Giulia SUV. Indeed, the styling is very familiar, but that doesn’t make it any less exciting, although the base version and the mid-range Ti trim won’t look as desirable as this. The interior cabin has been largely carried over from the Giulia, and in the Quadrifoglio specification it features body-hugging seats, red stitching, carbon fiber trim, and other sporty touches as one would expect from an SUV powered by an engine that has Ferrari roots. Speaking of which, its heart and soul is a biturbo 2.9-liter V6 as seen in the Giulia Q with a monstrous 505 horsepower and 443 pound-feet of torque channeled to both axles through an eight-speed automatic transmission. It also takes advantage of a torque-vectoring rear differential and comes with a sportier suspension setup, while beefier brakes and larger wheels are also part of the package. On the options list, prospect buyers will find an assortment of upgrades like Brembo carbon-ceramic brakes, carbon-fiber Recaro seats, and a 14-speaker, 900-watt Harman Kardon audio system. In terms of performance, we remind you the Giulia sprints to 60 mph (96 kph) in 3.8 seconds, but the Stelvio needs an extra tenth of a second due to its increased weight. There’s also a difference in terms of top speed, with the sedan maxing out at 191 mph (307 kph) whereas the SUV can “only” do 177 mph (285 kph). But the Stelvio isn’t all about the spicy Quadrifoglio. The base and Ti versions are also interesting thanks to a turbocharged 2.0-liter engine with 280 hp and 306 lb-ft of torque, which is enough Italian muscle for a more than decent top speed of 144 mph (231 kph). Regardless of the trim you go for, all models come as standard with Alfa’s proprietary Q4 all-wheel drive system. Even the entry-level version gets chunky 18-inch wheels, while those willing to upgrade to the Ti trim will get a 19-inch set along with extra goodies such as real wood trim, an 8.8-inch infotainment screen (instead of the base 6.5-inch setup), along with the possibility of opting for Lusso and Sport packages, which will be detailed later on. There’s no word about pricing just yet, but you can imagine the Stelvio will cost more than the equivalent Giulia. That means the Stelvio Quadrifoglio will cost significantly more than the $65,000 estimated starting price of the Giulia Q due to go on sale in U.S. next month. 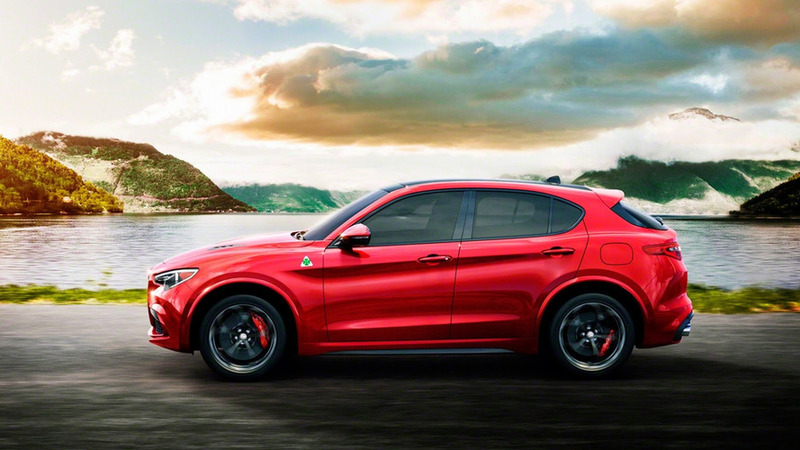 Alfa Romeo unveils its first SUV at the Los Angeles Auto Show - in Quadrifoglio guise. "Meccanica delle emozioni" in a SUV with striking design, performance and technology, which encapsulates the authentic Alfa Romeo spirit. A name that conjures up legendary achievements on Italy's highest mountain pass. Italian styling, expressing proportion, simplicity and high-quality surfacing. Powered by the 510 HP 2.9-litre V6 BiTurbo petrol engine inspired by Ferrari technologies and technical know-how. All-wheel drive with Q4 technology designed to manage the car's drive distribution in real time. Unique, ground-breaking technical solutions, including Torque Vectoring technology, for the utmost control of traction, and the Integrated Brake System, which significantly reduces braking distance on any road surface. An exhilarating driving experience thanks to the exclusive architecture of the AlfaLinkTM suspension, perfect weight distribution and an outstanding power-to-weight ratio. Alfa Romeo has confirmed that the Stelvio engine range will include the 280 HP 2.0-litre Turbo petrol with 8-speed automatic transmission. 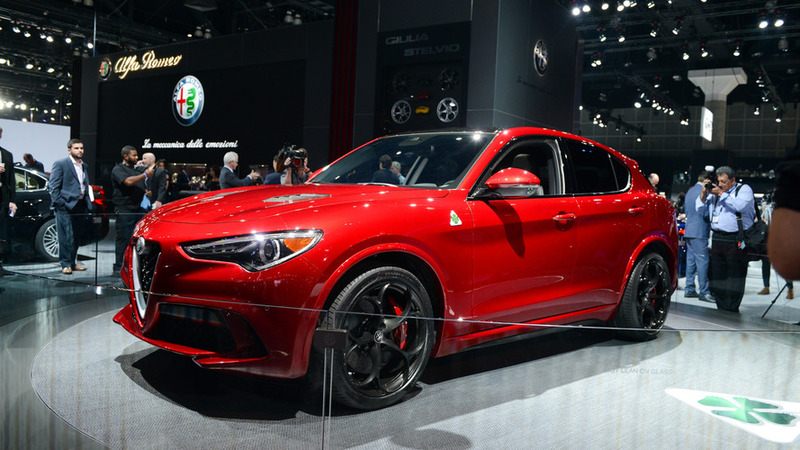 The latest Alfa Romeo creation makes its début today at the Los Angeles Auto Show, in Quadrifoglio guise: launched under the name Stelvio, it is the brand's first SUV in over a century of history. Set to become the benchmark for the segment, the new model encapsulates the authentic Alfa Romeo spirit, incorporating the five ingredients that make it one of the world's most desirable brands on the automotive stage: distinctly Italian styling; innovative, state-of-the-art engines; impeccable weight distribution; unique technical solutions; and an outstanding power-to-weight ratio. Developed in Alfa Romeo's prestigious engineering centre in Modena, in the heart of Italy's Motor Valley, the Stelvio SUV will be manufactured in the recently overhauled Cassino plant on a production line dedicated exclusively to the latest Alfa Romeo models - including the stunning Giulia, which launched the brand into a new era in 2015, with its revolutionary styling, sports handling and technology. The same ingredients, tailored to a new class of car, are now back, in the ground-breaking Stelvio SUV, which offers pure-bred Alfa Romeo sports styling, top-class performance and technical and technological equipment levels without equal in the premium small SUV segment. Starting with its name, Alfa Romeo's new SUV is guaranteed to deliver an exhilarating driving experience, set to astonish even the most discerning and accomplished drivers. The Stelvio pass is the highest mountain pass in Italy (and the second highest in Europe), and the 20 km road that crosses it boasts over 75 bends, breath-taking views and a dizzyingly quick rise in altitude, all the way up to 2,758 metres. Over the years, champions of cycling and motorsport have done battle here, making the route a fully fledged sporting legend. An important transport artery in the war years of the last century, this winding road has now become a major tourist attraction. To enjoy it as it is meant to be enjoyed and squeeze every last drop of pleasure out of this unique experience - by oneself or in the company of friends and family - there is only one SUV capable of offering an unrivalled combination of driving pleasure, Italian styling and versatility: that is the Alfa Romeo Stelvio. The Alfa Romeo Stelvio is a perfect blend of heritage, speed and beauty; and its magical alchemy forms an integral part of the brand's history, dating back over a century. Achieving this mix, now as in the past, takes a talent for combining the three special ingredients of Italian design: proportion, simplicity and top-quality surfacing. These same ingredients spawned the Giulia - the new Alfa Romeo benchmark and precursor of the brand's future - and have been comprehensively reworked to adapt them to the altogether different volume of a Sports Utility Vehicle. The Stelvio's proportions, in particular, express strength, dynamism and compactness, as witness its modest length of 468 cm, height of 165 cm and width of 216 cm. The side view confirms this impression, with an outline that suggests a compact car, starting at the front and developing towards the rear, and a cabin that ends on a steeply raked rear hatch, topped with an spoiler for maximum aerodynamic performance - a crucial consideration on a car that packs this much punch. The Alfa Romeo styling also finds expression in the high-quality surfacing, which involves creating rich, harmonious reflections across the volumes. The end-result is a sculptural shape, which on the flanks of the Stelvio, for example, gives rise to stark contrasts between the surfaces that catch the light and those that remain in shadow. Basically, the "musculature" of the car's sides accentuates its front and rear wings. The Quadrifoglio version unveiled in Los Angeles, also features a body-coloured side-skirt with a carbon insert that further accentuates the car's sporting character. These features, combined with the front and rear bumpers and powerfully styled wheel-arches, all in the same colour as the bodywork, make the Stelvio Quadrifoglio more like a sports saloon than a traditional SUV in this segment. The third aspect of Alfa Romeo style is the "simplicity" that masks one of the most complex creative processes in the industry: designing a car. Because styling has the job of concealing the long, complex task of creating the simple, natural lines that highlight the shapely elegance and tasteful sophistication of Italian-made products. And this same approach pervades the entire history of Alfa Romeo design, which has always expressed itself through clean, taut lines. That's why the Stelvio has such a strong identity, built around a few select features, like the cloverleaf front end, which is perhaps the most famous and recognisable hallmark in automotive styling. The front end of the Stelvio Quadrifoglio also embodies a strong hint of power and aggression, thanks chiefly to the specific air vents for the intercoolers and the classic apertures around the shield-shaped grille, combined with "sinewy" surfacing. 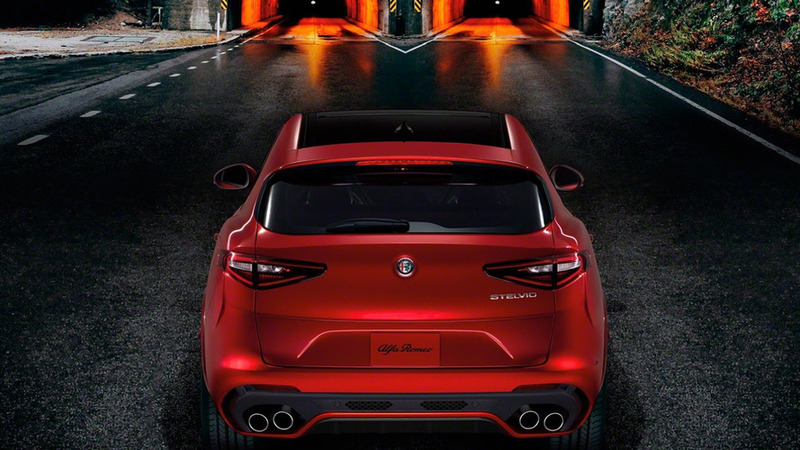 The back end of the Stelvio is instantly eye-catching too, because of the sporting appearance it gets from its lower portion, characterised by the four exhaust tips, and from the "Kamm tail" styling that gives the car a unique, unmistakeable character, while also paying tribute to Alfa Romeo's history - because this distinctive design also featured on some of its most prestigious performance-oriented models and competition cars. The same sporting inspiration makes another appearance in the Stelvio SUV's clean, uncluttered, interior, which is totally driver-centric, as you can see from the grouping of all the controls on the small, direct steering wheel, designed to suit all driving styles. But that's not all. The driver's position has been forged around the driver, with a diagonal tunnel and slightly undulating dashboard; and it has been "tailored" like a bespoke suit, with painstaking craftsmanship and premium materials: the carbon fibre, wood and fabrics have all been chosen for their visual and tactile appeal and assembled to give a palpable sense of human artistry. 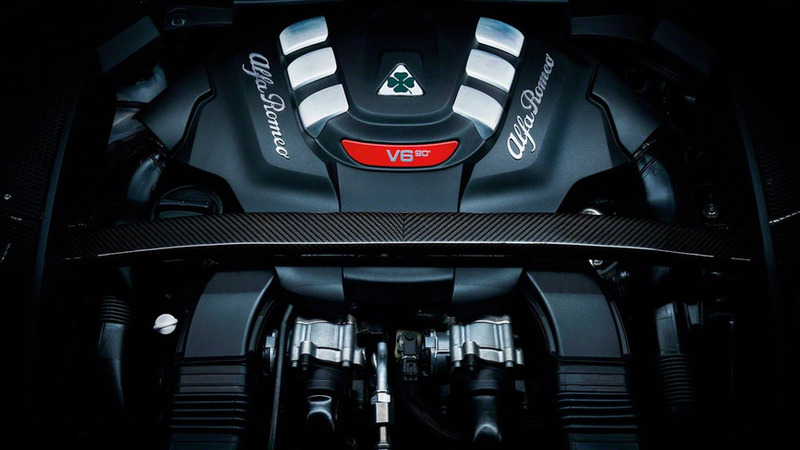 State-of-the-art, innovative engines are another hallmark of a genuine Alfa Romeo. That's why the Stelvio Quadrifoglio mounts a unique power plant in terms of both technology and performance: a 510 HP 2.9-litre V6 BiTurbo petrol with 8-speed automatic transmission. Drawing inspiration from Ferrari technologies and technical know-how, the 6-cylinder BiTurbo petrol engine is made entirely of aluminium to reduce the weight of the vehicle, especially over the front axle. What's more, despite its phenomenal torque and horsepower, the 510 HP 2.9-litre BiTurbo Petrol is also incredibly efficient in terms of fuel consumption, thanks to its electronically controlled cylinder deactivation system. And like all Alfa Romeo's next-generation engines, the Stelvio Quadrifoglio's 2.9-litre V6 BiTurbo petrol unit will, of course, deliver that distinctive Alfa Romeo engine note to complement the performance. Lastly, the 8-speed ZF automatic transmission is specifically calibrated to make gear changes in just 150 milliseconds in Race mode. The transmission also features a lock-up clutch to give the driver a powerful feeling of in-gear acceleration once the gear is engaged. Depending on the mode you set with the AlfaTM DNA Pro selector, what's more, the auto box optimises fluidity, comfort and ease of driving in all environments, including around town, and further improves fuel consumption and CO2 emissions. Steering-column-mounted, aluminium paddle shifters also feature as standard. As well as this 510 HP unit that's exclusive to the Quadrifoglio guises, Alfa Romeo has confirmed that the other engines in the Stelvio range will include the 280 HP 2.0-litre Turbo petrol with 8-speed automatic transmission.This is an all-aluminium 4-cylinder unit that puts out 280 HP at 5,250 rpm and maximum torque of 400Nm at 2,250 rpm. In addition to the MultiAir electrohydraulic valve actuation system, the distinctive features of this engine include the "2-in-1" turbo system and the 200-bar high-pressure direct injection system, which deliver a particularly quick response to accelerator inputs across the rev range, plus first-class fuel-efficiency. In keeping with Alfa Romeo's technical traditions, electronic assistance must never be intrusive, but merely facilitate the driving experience, which is exhilarating in itself thanks to the passionately and painstakingly designed chassis and suspension system. The Stelvio Quadrifoglio unveiled in Los Angeles confirms this philosophy, because it is structurally unique and engaging, but still offers numerous sophisticated systems to make the driving experience - which is already assured by the car's underlying technical excellence - even more exciting. The Stelvio Quadrifoglio mounts an innovative all-wheel drive system with Q4 technology, designed to manage drive distribution in real time, so as to deliver top-notch performance, efficiency and safety. To put it in a nutshell, the Q4 system on Alfa Romeo's new SUV provides all the advantages of all-wheel drive, plus good fuel economy, responsive performance and all the driving pleasure of a rear-wheel drive car. The Q4 system's architecture includes an active transfer case and front differential designed to meet the specific technical requirements of Alfa Romeo, entailing the rapid-response management of high torque levels, with a compact, lightweight set-up. The transfer case makes use of advanced active clutch technology to deliver an outstandingly dynamic ride combined with good fuel economy. The Next-Gen integrated actuator delivers high response speed and precise torque distribution, in line with the selected Alfa DNA Pro drive mode setting. The Q4 system continuously monitors numerous parameters to optimise torque distribution between the two axles according to what the car is doing and how much grip there is beneath the wheels. This technology can predict imminent loss of grip by processing the data it receives from the lateral and longitudinal acceleration, steering-wheel angle and yaw sensors. In normal conditions, the Stelvio Quadrifoglio with Q4 system acts like a rear-drive vehicle, with 100% of the torque sent to the rear axle. As the wheels approach their grip limit, the system transfers up to 50% of the torque to the front axle via a dedicated transfer case. To modulate torque distribution with the utmost speed, the system uses a high degree of mechanical over-slip (up to 2.5%) between the two axles, which translates into class-leading control in terms of traction and directional stability when cornering. Combined with Q4 all-wheel drive for the first time, Alfa Romeo's Torque Vectoring technology optimises the Stelvio Quadrifoglio's drive distribution and accentuates its sporting character. The two clutches in the rear differential make it possible to control torque delivery to each wheel separately. So power is transferred to the ground more effectively, even when you drive the car to its dynamic limits. This makes the Stelvio safe and fun to drive at all times, without recourse to intrusive inputs from the stability control system. Up front, the Stelvio Quadrifoglio has a double wishbone system with semi-virtual steering axis, to optimise bump filtration and ensure quick, precise responses to steering inputs. By keeping the contact patch of the tyre constant when cornering, this exclusive Alfa Romeo set-up affords outstanding levels of lateral grip. But regardless of speed and conditions, the Alfa Romeo Stelvio always delivers a natural, instinctive drive. The rear suspension uses a four-and-a-half link system - patented by Alfa Romeo - to deliver a winning combination of performance, driving pleasure and comfort. An electronically controlled damping system, furthermore, adapts to driving conditions instant by instant, enabling you to opt for more performance-biased or comfort-oriented handling. Having made its début on the Giulia, Alfa Romeo's unique Integrated Brake System (IBS) is now in use on the Stelvio Quadrifoglio. This innovative electromechanical system combines stability control with a traditional servo brake to guarantee instantaneous brake response and short stopping distances, while significantly contributing to weight optimisation. The Stelvio Quadrifoglio's braking system comprises aluminium components and carbon-ceramic discs. The AlfaTM Chassis Domain Control (CDC) system acts as the "brain" of the Stelvio Quadrifoglio, and coordinates all the car's electronic systems. It manages the operation of the various tech systems - such as the new AlfaTM DNA Pro selector, the Q4 all-wheel drive, the AlfaTM Torque Vectoring system, the active suspension and the ESC - and optimises performance and driving pleasure. Basically, the CDC adapts the chassis geometry in real time, dynamically adjusting the mapping of the AlfaTM DNA Pro modes on the basis the acceleration and rotation data detected by the sensors. Critical situations are prevented and managed by informing the specific control units involved in the electronic system of the car in advance: chassis, powertrain, suspension system, braking system, steering, power steering and differential on curves. As other models on the Alfa Romeo line-up, the Stelvio SUV fits a host of features developed in collaboration with Magneti Marelli - from lighting devices to powertrain, suspensions and exhaust systems and the new Connect 3D Nav 8.8" Infotainment unit - as further confirmation of the consolidated and mutually profitable collaboration between Alfa Romeo and the well-known international leader in the design and manufacturing of high-tech automotive systems and components. One of the primary objectives of the design of the Stelvio Quadrifoglio was to achieve maximum driving pleasure. The key contributors to this are the perfect weight distribution between the two axles and an optimum power-to-weight ratio. The first of these required astute management of weights and materials, which was achieved by tweaking the layout of Alfa Romeo's new SUV and locating all the heaviest components as centrally as possible. The ideal power-to-weight ratio, meanwhile, was achieved by using ultra-lightweight materials such as carbon fibre for the driveshaft and aluminium for the engine, suspensions, brakes, doors, wheel-arches, bonnet and liftgate. The reduced weight does not affect the car's excellent torsional rigidity, which guarantees durability, low noise levels and first-class handling even under extreme stresses.